In the first installment of MIC’s Music Power Players series, CAA’s Mitch Rose joined us to talk about his journey through the music industry. CAA, or Creative Artists Agency, is the world’s leading entertainment and sports agency. There, Mitch Rose is the Co-Head of Contemporary Music. He manages 100+ people in Los Angeles, Nashville, and London and works on putting bands on the road in successful ways. Learn how to connect with people. Failure is good! There is failure in life. Don’t be afraid to take a stand. Learn how to read a situation and connect with the people involved. Make people like you! Make yourself an interesting person. Show off your passions. Learn about things outside of your comfort zone and talk to people about them. Always be truthful and no one will doubt you. Stop looking down at your device, look up! Life is happening around you. Learn how to work in a team. You have to be egoless and selfless. Don’t be afraid to show enthusiasm. We are very grateful to Mitch Rose for giving us his time and wisdom. If you’re interested in working in the music industry, keep your eye out for more Music Power Players events hosted by MIC in the future. For our first Office Hours event of this school year, we were joined by Grammy nominated musician and UCLA alumna Este Haim. After graduating from UCLA in 2010 with a degree in Ethnomusicology, Este formed HAIM with her sisters Danielle and Alana. Since, they have released 2 albums and won countless awards, including the NME Award for Best International Band in 2014 and 2018. When asked about what advice she would give to someone trying to break into the industry, she shared many inspirational words with us. She says you need to have a goal and chase it, no matter what roadblocks come up along the way: “See it and believe it and never give up on it.” Always take the opportunity to network and collaborate with others because you never know what might come out of it. For musicians, Este emphasized the importance of knowing how to do it all: know how to write, record, and mix all of your music yourself. After answering questions from the audience, Este stayed around and talked to all the students, greeting and speaking to them with such genuine kindness and interest. We cannot thank Este enough for being our first guest of Office Hours this year and for giving us some of her time and wisdom! 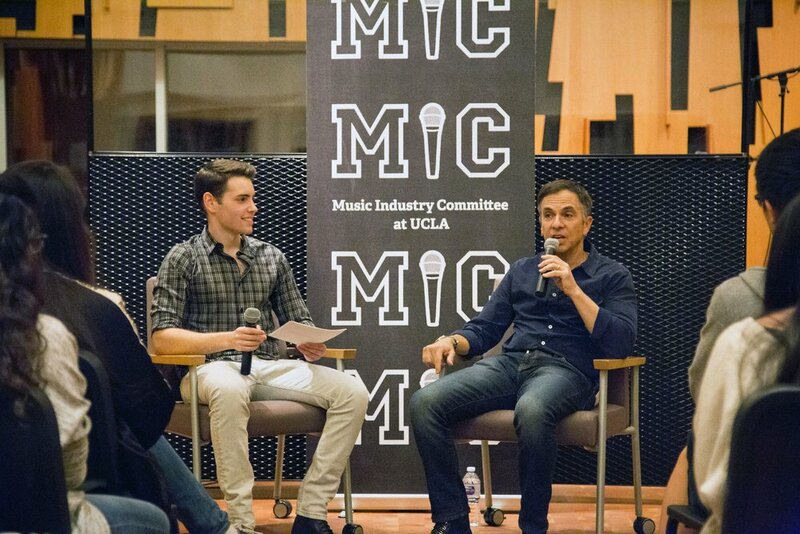 Last Tuesday, Peter Petro of Crē•8 Music Academy spent the evening with UCLA students as part of MIC at UCLA’s Music Careers 101 series. After years spent working in various parts of the industry—including artist development, radio production, music supervision, and music journalism—Petro now works at the Director of Admissions at Crē•8 Music Academy, a partner of the renowned Westlake Recording Studios (Rihanna, The Chainsmokers, Jay Z, Adele, etc). Throughout his varied career, Petro has acquired extensive knowledge about the industry which he readily shared with our students. Before eagerly jumping into audience questions, Petro shared a few general pieces of advice. He started out by saying, “I want you guys to feel empowered that at any moment in your life you can do things and move yourselves forward in your interest in music.” The rest of his personal advice took on the same optimistic tone. to knock out as many excuses as possible." How competitive is my product? Can it solve an important problem? Is my solution valuable and rare? How much does it cost (time, money, risk)? After finishing his extremely helpful Q&A session, Petro listened and gave feedback to a student who submitted his music for review, assessing the product using the questions above. We can’t thank Peter enough for spending his night here and sharing his knowledge and advice with us! Make sure to follow us on Instagram (@micatucla) to stay up to date on more talks in the Music Careers 101 series as well as all our other industry related events! On Monday night, the Music Industry Committee at UCLA hosted 20x Platinum producer-songwriters The Swaggernautz for an intimate Q&A session on The Hill. The duo, made up of Tat Tong and Jovany Javier, excitedly answered questions about their songwriting process, tips for succeeding in the music industry, and the importance of putting yourself out there. The Swaggernautz’s catalog of hits, both domestic and global, shows that they are good at what they do. But what became apparent as soon as they starting speaking to our students was that they absolutely love it too. The combination of the two makes the future of their careers look extremely promising. Their success has also given them the platform to start helping others start their careers in this industry and we are extremely lucky to be recipients of their generosity. Not only did they spend their Monday night chatting with us, but they will be mentoring selected UCLA student musicians through a Songwriting Camp later this week as well. Check back here for more updates on this unique project coming soon! Connect with The Swaggernautz on Instagram (@theswaggernautz) and while you’re there, make sure you’re following us (@micatucla) so you can stay up to date on other events like this that MIC at UCLA is bringing to campus this year! UCLA has earned the title of the nation's top public university in the 2017-18 Times Higher Education World University Rankings! Published on September 5th 2017, the report also ranked UCLA as the top 15th university in the world. These rankings consider a variety of performance indicators from knowledge transfer, student-to-faculty ratio and international outlook to the quality of teaching and research.